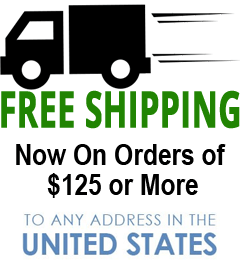 Save an additional $6 with Free Shipping within the US when you Subscribe & Save with 3 or more bags of coffee! When used properly, coffee can help give you the lasting energy and mental clarity you need throughout your day. Yet, that’s just scratching the surface of the prolific health benefits that coffee has to offer, which are unknown to most people. If you are not already drinking coffee, then you’re missing out on many powerful thyroid-boosting benefits that coffee has to offer. Protects your thyroid gland from thyroid disease. Lowers thyroid-suppressive estrogen while boosting thyroid-supportive progesterone. Yet, the health benefits of coffee don’t stop there. Studies also show that coffee helps to lower your risk of numerous diseases, which in turn can help you to live a longer, happier and healthier life. Simply put, coffee is one of the most effective health foods you can possibly use. If you’re not using coffee then you’re really doing yourself and your thyroid a disservice. Now, if you are already drinking coffee, then hopefully you’re not making any these 4 common coffee mistakes that may be preventing you from getting the maximum thyroid-boosting and health benefits that coffee has to offer. Which of These 4 Common Coffee Mistakes Are You Making? Just like any thyroid-boosting supplement you might use, you want to get the maximum benefit from that supplement. Yet, many people are committing all four of these common coffee mistakes without even realizing it. Not all coffee is created equal. Most coffee producers use lower grade beans that are more susceptible to growing mold and contain higher levels of mycotoxins. Some try to hide this behind naming, such as “gourmet” coffee, or other fancy sounding descriptions that really don’t mean anything. Yet, if you want to minimize mold and mycotoxins then you need to stick with the highest grade coffee, which is termed “specialty coffee”. Coffee is one of the most heavily pesticide-treated crops in the world. That means 97 percent of coffee you might be drinking is cause for concern. While there may be some debate over how much of these chemicals make it through roasting, you’ll never have to worry with organic coffee. Some of coffee’s most important health benefits come from the roasting process. Yet, this is where most coffee producers get it all wrong. Studies continue to show that many of coffee’s health benefits stem from its high levels of antioxidants. And these antioxidants are largely determined by the roasting of the coffee. Green coffee beans are rich in antioxidants referred to as Chlorogenic Acids (CGA’s). Maybe you’ve heard of green coffee bean extract that is supposed to help with weight loss? That’s nothing more than these CGA’s. When observed within a test-tube the antioxidant effects of CGA’s look extremely promising. This has prompted a movement toward lighter roast coffees higher in CGA’s, which many consider to be healthier. …this tells a completely different story. Significant increase in thyroid-supportive nicotinic acid (niacin). Not only does darker roast coffee provide significantly greater thyroid-boosting and antioxidant benefits… it also promotes significantly more weight loss. As you can see, using the wrong coffee roast can significantly reduce the thyroid-boosting health benefits that coffee has to offer. There’s no point in trying to maximize the health benefits of your coffee if you’re going to let those benefits go to waste. The strong antioxidants in your coffee are stored inside the coffee beans. So, if you’re purchasing coffee that is pre-ground, or even if you’re grinding it yourself at the store before you take it home, a large portion of those antioxidants will be degraded long before the coffee ever reaches your lips. You’ve already lost a lot of the antioxidant health benefits. In order to maximize the antioxidants, you also need to consider how the coffee is packaged. The antioxidant benefits of coffee are greatest when coffee is freshly roasted. When coffee is sitting on store shelves, shipped by mail, or simply sits in your pantry over the course of days or weeks, this too can compromise the antioxidant benefits. This is why it’s best to purchase coffee in packaging that has been nitrogen flushed to preserve and maximize your antioxidants. Unfortunately most producers forgo nitrogen flushing in order to increase their profits, while you and your coffee pay the price. What’s the Point of Using Coffee Whose Health Benefits Have Already Been Wasted? As I tell all our clients, you shouldn’t only be enjoying coffee for the taste and how it makes you feel… you should also be enjoying it for all of the health benefits it has to offer. The benefits of coffee are so great that we consider it to be more of a supplement than a food. Buying bad coffee is like buying an old expired supplement that has already gone bad before you ever use it. It just doesn’t make any sense. Who doesn’t want the freshest, purest, best tasting, and highest quality coffee that gives you the best results with your thyroid health? Since we recommend and use coffee with all of our thyroid clients, we decided it was time to formulate and produce a coffee designed specifically for thyroid health. …we have now created what we consider to be coffee perfection, both in terms of health benefits and taste. 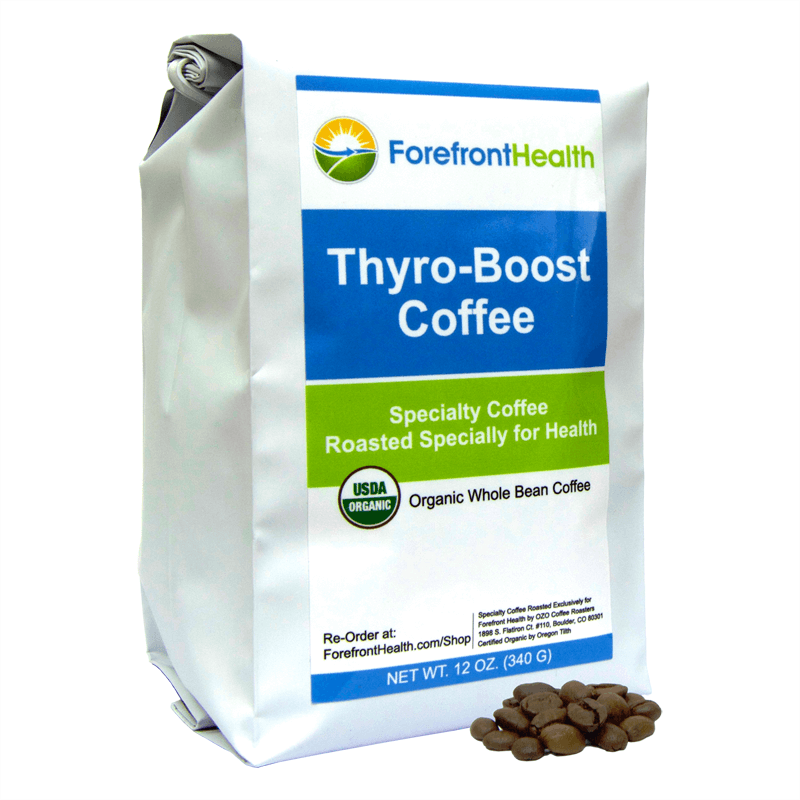 We call it… Forefront Health Thyro-Boost Coffee. It’s specialty coffee roasted specially for your thyroid health. We only use the highest quality organic and specialty grade coffee beans to eliminate molds and mycotoxins as well as synthetic pesticides and chemicals… so you can rest assured knowing that the only thing in your coffee is coffee. We specially roast our beans to maximize the thyroid-boosting effects and healthy antioxidants levels… so you get the maximum health benefits you deserve from your coffee rather than allowing them to go to waste. We package our coffee beans with a nitrogen flush to lock in the freshness and amazing flavor while maintaining the highest antioxidant levels to extend the health benefits of your coffee. This way you can enjoy your coffee when you’re ready, without being rushed, and without losing out on any of the thyroid-boosting effects. 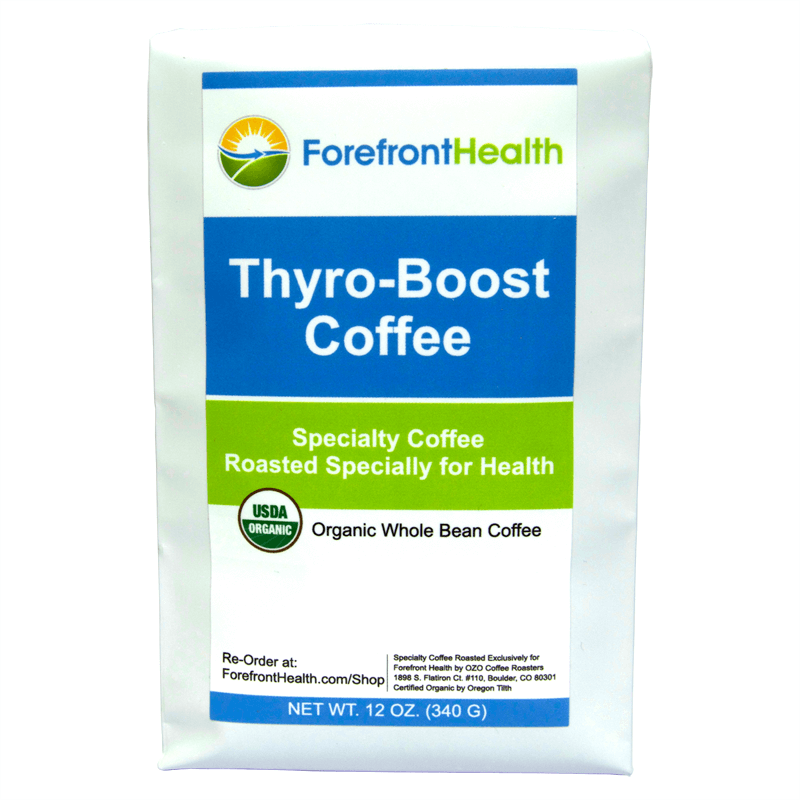 We recommend brewing 2 tablespoons (15 grams) of freshly ground coffee Thyro-Boost Coffee per cup (8 oz. / 326 ml) of water. You can brew it any way you’d like including drip, French-press, percolate, etc. It has no effect on the health benefits at all. While even as little as 1 cup of coffee (8 oz. / 326 ml) per day provides significant health benefits… research shows that 3 to 5 cups of coffee per day can have tremendous effects on your health. We always start slowly with our clients and increase coffee intake over time based on a dose and dosing schedule that helps them feel their best. For best effect and tolerance, we have our clients sip their coffee with and after meals. If tolerance is a concern, then we start slowly with as small of a dose as tolerated, used only with meals and only with adequate carbohydrate and fat to help slow the digestion and absorption of the caffeine while maintaining proper blood sugar handling. If you struggle with tolerating coffee, you can fix this so you too can reap all of the thyroid-boosting and health benefits that coffee has to offer. Contains 12 oz. (340 g) of fresh, organic, specialty grade, pure, clean thyroid-boosting coffee. Ingredients: fresh, organic, specialty grade, pure, clean thyroid-boosting coffee. Contains 12 oz. (340 g) whole bean coffee. The first thing that I am very pleased about is the fast shipping of products and receiving orders in two days! Regarding the new coffee, it has a delicious flavor! I really like the way this coffee tastes and knowing how healthy it is, is just another plus about this product. I also purchased the grinder, and it’s easy to use. I recommend both products! I was delighted to find this coffee roast so much lighter than all the “city roast” coffee found in specialty shops or even in the grocery store. This tastes so much more like the coffee available when I was a child. And I especially appreciate it’s being organic. Now I don’t have to put cream in my coffee to make it drinkable. So happy that this shipped quickly! It’s very fresh and incredibly smooooooooooth. The flavor is wonderful and no bitter aftertaste or sourness. No heartburn! Thank you for a great product!